After 25 years of growing grapes, the 18 hectare vineyard is now fully mature, producing true varietal fruit characters with great concentration of flavours. The focus is on crafting distinctive wines that accentuate a particular takiwa (place, district, region, time, season, space), that adds individual complexity to the varietal character and allows true expression of a great site. The two friends met in Adelaide in 1976 when the Australian wine industry was going through tough times. 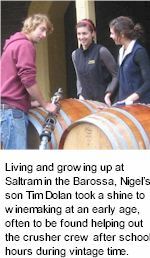 Peter was a 21 year old science student from Geelong, Victoria, who'd just got his first job in the wine sector as a cellar hand at Thomas Hardy & Sons inner city Mile End winery, where Tim was the production winemaker. They struck up a remarkable friendship that has spanned three decades, and seen them work alongside each other for 20 years at Hardys before moving on in more recent times to new jobs and ventures. They have a collective winemaking experience of more than 60 years and their interest in wine runs much deeper than at career level. 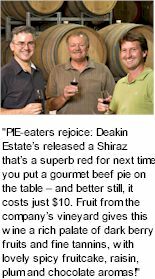 Deakin Estate vineyard and winery complex is at Red Cliffs, near Mildura in the Murray Valley of North West Victoria. Alfred Deakin, a former Prime Minister of Australia, encouraged California's Chaffey Brothers to bring their irrigation expertise to the vast inland valley of the Murray River in North West Victoria. 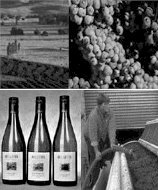 Since then the region has become one of Australia's most productive and prosperous sources of high quality produce including citrus, olives, almonds and grapes. Deutz marries the best of Marlborough grapes with Champagne methodology, presenting us with a multi award winning new world Brut Cuvée. 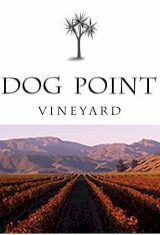 A very stylish Marlborough assemblage of Pinot Noir and Chardonnay from Marlborough vineyards intentionally planted to create this very wine. Crisp, with impressive complexity and richness, yeasty and nutty flavours, excellent vigour and length. 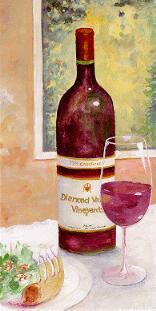 Diamond Valley Vineyards was established in 1976 by the Lance family, on highly scenic terroir, along the beautiful Yarra River Valley. The hillside estate's vineyard is blessed with pure air, bathed in sunlight, it is a haven for kangaroos and native birds. The aim was to grow the finest grapes possible, and to handcraft them into elegant and distinctive wines of the highest quality. These were days of few fences, of boundary riders and boundary keeping dogs. Shepherd's dogs sometimes became lost or wandered off and eventually bred into a marauding pack which attacked local flocks. These delinquent canines would retreat to a tussock and scrub covered hill which they inhabited, overlooking the Wairau Plains, designated by the early settlers as Dog Point. Arthur’s father and uncle, Arthur (Tim) and Thomas respectively, were the sons of Thomas Dolan, an Irish immigrant who settled in Clare circa 1860. 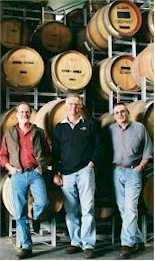 These two brothers initiated the Dolan winemaking passion and pedigree when they commenced developing an 88 acre vineyard and small winery in 1895 on Dolan Road at Stanley Flat, just north of the Clare township. 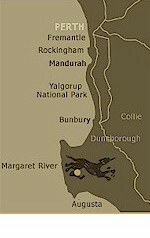 Bryan’s family moved to the southeast of South Australia where he grew up in Naracoorte. This rural environment led him to enrol in agricultural studies at Roseworthy College. When the first oenology course was offered a year later, Bryan signed on and subsequently graduated in 1949. 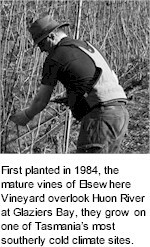 That same year he accepted a job offered by Henry Martin, owner of the Stonyfell and Saltram vineyards and wineries. 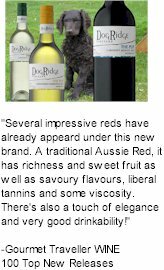 The Portet family lays claim to a singular accolade in the Australian wine Industry. 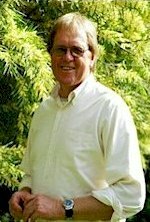 Dominique is the ninth generation in his family to be committed to winemaking, yet he is the first to establish a winery and label bearing the family name. 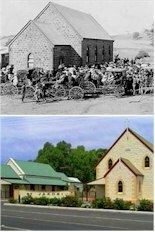 Since 1976 he has lived in Australia to create a family. "I'm at home here, I think my roots are here now." Although he now calls Australia home, Dominique Portet's bond with Bordeaux cannot be broken. 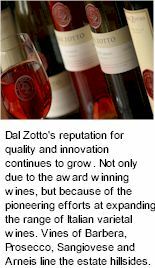 His family has had links with the wine industry since 1780. "It is longer, but most of the records were lost during the revolution." The earliest document dated 1720, relates to the sale of Eaux de vie by Portet to the Martells. 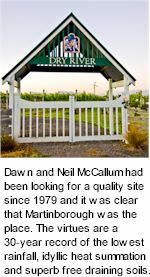 Dawn and Neil McCallum had been looking for a site for a quality vineyard as early as 1979 and it was clear that Martinborough was the place to investigate. 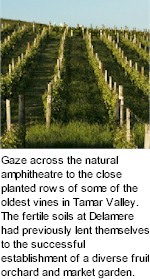 According to friend and soil scientist Dr Derek Milne, a founding partner of Martinborough Vineyard, the virtue of this locality was its 30-year record of the lowest rainfall in the North Island and a heat summation appropriate for growing quality cool-climate varieties such as Pinot noir, Riesling and etc. The crescent-shaped area lay along the edge of the river terrace formed by the Ruamahunga and Huangarua rivers about 20,000 years ago. From the available data, the low rainfall area was limited to a tiny locality roughly 5 km in radius, and a study of soil maps revealed that the deep, free-draining gravels they sought within this were restricted to an even smaller part. Once upon a time around the end of the 19th century, this 72 acre patch of real estate included only a few acres of vineyard, with most of the area being dedicated to cropping and dairy cattle. 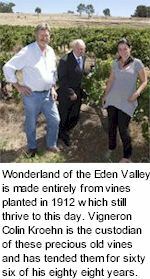 At the start of the 1930's Oscar Semmler, winemaker Wayne Dutschke's grandfather bought the block and more vineyard was planted, but it remained primarily a grazing area for dairy purposes. 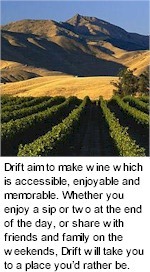 Oscar's Semmler's Dad referred to the dirt as a wonder of creation, a fact borne out by the wine now coming from it. The vineyard of that time while reflecting the fortified market of the day, did not predict the potential to produce the rich varietal flavours found in current production.